DADaPalooza: Mermaid Theatre delayed, but Ralph Covert is Pinch Hitting! Mermaid Theatre delayed, but Ralph Covert is Pinch Hitting! The Chicago Children's Theatre is sending in a very capable pinch hitter! Instead, CCT is sending in Ralph Covert, who is one of the best known and top-rated kid's rock music makers in Chicago. He's debuting his show Ralph's World Rocks and Reads! -a best-of live concert and multimedia experience featuring every family's favorite Ralph's World songs. Covert's top tunes correspond with his ever popular early learning children's picture books including "Sawdust & Spangles" and his newest book, "Ralph's World Rocks!" The show is backed up with a multimedia backdrop and lots of opportunities to sing along, play along, and get along. And no, Covert will not be performing in a mermaid costume. Covert had already been planning to present the concert at the Chicago Children's Theatre at some point in the future, and he's simply accelerated the schedule. 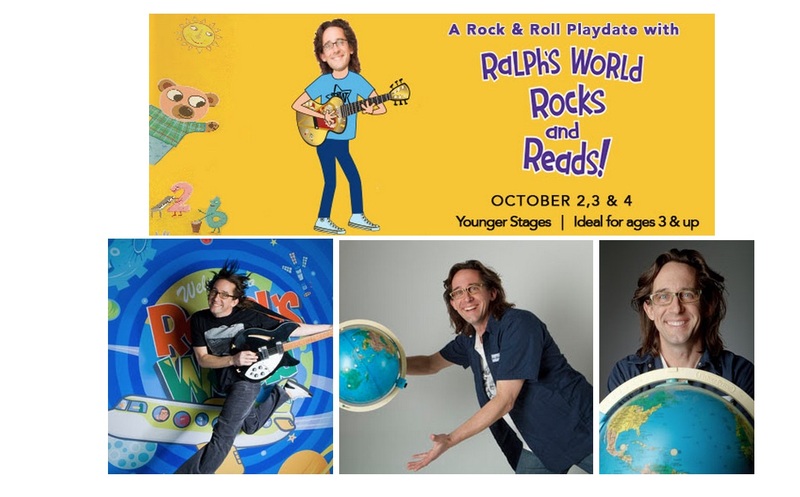 Ralph is a great performer, and if you are looking for something wonderful to do for your tiny kids (this show is a Younger Stages production best for kids ages 3 and up), this would be great. This weekend's performances are Friday, October 2 at 10 a.m. and 6:30 pm, Saturday, October 4 at 11 a.m., 2 p.m. and 6 p.m., and Sunday, October 5 at 11 a.m. and 2 p.m.
Chicago Children's Theatre productions are presented at the Ruth Page Center for the Arts, 1016 N. Dearborn St. in Chicago. Tickets are $10-$39. For tickets and information, visit chicagochildrenstheatre.org or call (872) 222-9555. Next week's performances of Goodnight Moon & The Runaway Bunny, originally slated to run through next Sunday, October 11, are still on the CCT schedule. Covert, however, is on standby and ready to perform Ralph's World Rocks and Reads! through October 11 as well. Stay tuned for an announcement early next week about next week's performances. Currently, the Chicago Children's Theatre box office is contacting all Goodnight Moon ticket buyers to review their options, including staying with their current performance date and time but seeing Ralph's World Rocks and Reads! instead, exchanges into other Younger Stages productions coming this season, or refunds.